Let me start by saying that I love traveling and I love racing. Let me also mention that I am the average person when it comes to income. Sometimes this limits me from doing all the epic races that I have on my bucket list. I recently discovered that there is a way to fill the void between races that is not only cheap but tons of fun! “FatAss” or training races are a cheap, easy way to get some long miles in while also being able to spend time with good friends. It was as easy as creating a Facebook event and inviting good people. I wanted to add some cool perks to my event so I reserved a keg of beer from Martin House Brewing Company, where I am currently employed. I also put together a few gift bags for prizes including some cool brewery swag and other goodies. My buddy Drew Flowers and I hosted a spaghetti dinner/camp out at my ranch, where the event was being held the night prior to the race. We all sat around the cabin eating good food, talking about life and racing, and watching Finding Traction, a documentary about legendary ultrarunner Nikki Kimball. It was a great way to break the ice considering that a lot of the people attending my race I had only gotten to meet just a couple of times previously. To take my race a step further, I recruited the help of close friend, Matthew Hay, to be my aid station “King.” He was responsible for making sure there was food and drink for everyone running that day. He doesn’t even run but he came out to support all of us and partake in the fun. Everyone pitched in with all kinds of good snacks and food for the aid station creating a buffet of tacos, cookies, cake, bananas, gels, and all of the other “energy” foods you associate with the typical race aid station. A few weeks prior to the race I had mapped out a loop that was around 1.7 miles and included the trail around my property as well as the massive hill leading up to it from the highway. Switching from trail to road and having to tackle some good hills made it that much more challenging, especially over the course of a few hours of running. The morning of the race we all gathered at “Canopy City” also known as the aid station to fuel up with breakfast tacos, coffee, and fruit. Once everyone had arrived I gave a quick race briefing at the starting line, we snapped a quick picture, and then we were off! I’m sure a few of you have heard the story about the famed Barkley Marathons and the start of the race being signaled by the lighting of a cigarette by Gary “Lazarus Lake” Cantrell. I figured it would be cool to have a unique signal for the start of my race so I recruited the help of our aid station leader. Once Matt shotgunned a beer (puncturing the bottom wall of a beer can, cracking the beer open, and draining it down his gullet as quick as possible) and the empty can hit the ground we were off! The concept behind my race was to repeat the 1.7 mile loop for 2, 4, 6, or 8 hours. You passed the aid station and bathroom on each loop. This also made the event itself easier to host and ensured that all of our runners had a good time and were safe. After all 15 or so of our runners had finished after 4 hours, we tapped the keg, fired up the grill, got the fire pit going and chowed down on some good food! 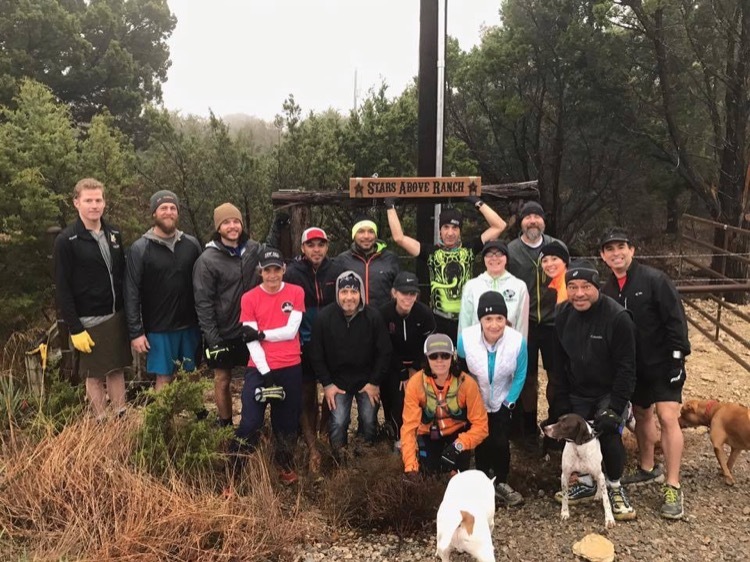 As much as I would’ve liked to have seen 6 and 8 hour finishers, I was extremely stoked with the turnout that we had considering that a good portion of our crew had been at Bandera the weekend before and some even had races the following weekend! The event that I had planned on doing annually suddenly became an event that people wanted to race every six months; meaning I am already in the planning stages of my next race which will take place in the summer heat here in Texas! After all my good friends had left that day, my buddy Matt and I saddled up to the nearly floated keg for one last pint of IPA before the impending storm rolled in. What a day. With a little effort and imagination we had just hosted our very first “FatAss” race. It turned out better than I had expected and I was truly proud of the outcome. In our sport it is easy to get caught up in the racing side of things. Planning race schedules, training, getting new gear, and trying to stay up on all the latest news is fun, but make sure to get out there and just run sometimes. Leave the watch at home and hit that favorite trail or road. Mix it up with friends. When it’s all said and done we are doing this because we love running, so don’t get so caught up in things that you forget why we do it! Cheers!